Senior Supreme Court Judge Justice Chelameswar refused to hear a PIL filed on behalf of former Union Law Minister and Senior Counsel Shanti Bhushan seeking clarification on the administrative authority of the Chief Justice of India (CJI) as the master of the roster and for laying down the principles and procedure to be followed in preparing it for allocation of cases. Advocate Prashant Bhushan mentioned before the Supreme Court bench presided over by Justice Chelameswar. But the Judge refused to hear the matter and said "I don't want another reversal of my order in 24 hrs". He also stated that the country would have to decide its own course and he did not want to hear this matter on the heels of his retirement. 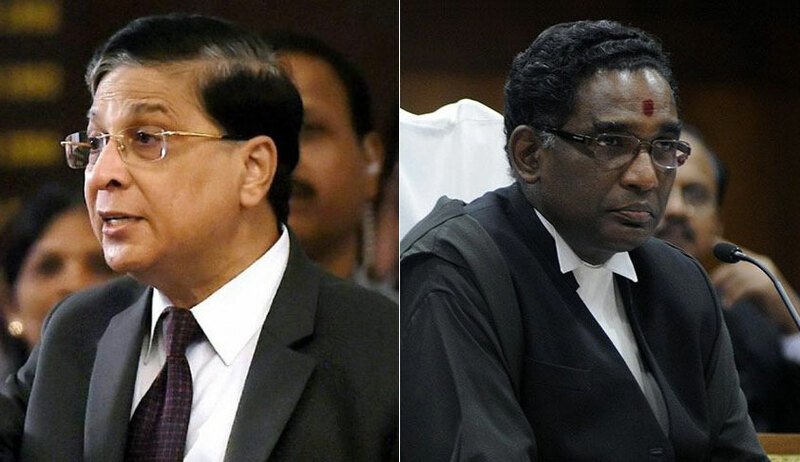 Justice Chelameswar was referring the November 10, 2017 Judgment of Constitution Bench in the case of Campaign for Judicial Accountability and Reforms wherein the Five Judge bench comprising Chief Justice Dipak Misra and Justices RK Agarwal, Arun Mishra, Amitava Roy and AM Khanwilkar annulled the order of two Judge Bench headed by Justice Chelameswar referring a petition filed by advocate Kamini Jaiswal, seeking fair and independent investigation into the allegations of bribery to settle a pending case (Medical College Bribary Case), to a Constitution bench of five senior-most Judges of the Supreme Court. He lamented before the bench, also comprising of Justices D. Y. Chandrachud and A. M. Khanwilkar, that despite continuous follow up with the Supreme Court registry for almost a week, the petition has not been numbered. “Have the defects been removed”?, inquired Justice Chandrachud. Mr. Bhushan responded in the affirmative. He also stated that he had earlier mentioned the matter before Court 2, presided over by Justice J. Chelameswar, but the bench conveyed that “it could not do anything about it”. The Chief Justice on Thursday assured Mr. Bhushan that they shall “look into it”. On Wednesday, reaffirming the superiority of the Chief Justice, the Supreme Court had dismissed a petition by Advocate Asok Pande which questioned the unilateral power of the CJI to constitute benches “arbitrarily” and allocate work to different benches and which sought framing of proper rules for it. Since the petition has impleaded CJI himself (presently Dipak Misra), Mr Bhushan has written to the Supreme Court, Secretary General, that in this case the Chief Justice should neither hear the case nor decide the roster for the hearing of this case. “‘Master of roster’ cannot be unguided and unbridled discretionary power, exercised arbitrarily by the Hon’ble Chief Justice of India by hand-picking benches of select Judges or by assigning cases to particular Judges. Any such power or its exercise would result in a subversion of democracy and the Rule of Law as guaranteed under Article 14 of the Constitution. “The authority of the Hon’ble Chief Justice of India as master of roster is not an absolute, arbitrary, singular power that is vested in the Chief Justice alone and which may be exercised with his sole discretion,” it says. Mr Bhushan alleged in the petition that the “authority vested in the Chief Justice of India must necessarily be exercised by him in consultation with the senior judges of the Supreme Court in keeping with the various pronouncement of this Hon’ble Court. “Underlying the evolution of the principle of the collegium is the Hon’ble Supreme Courts dictum that the collective opinion of a collegium of senior judges is much safer than the opinion of the Chief Justice alone”. The petition says even the international best practices are based on objective rules for case allocation that respect collegiality, the relevance of seniority, equality of the Justices, fairness of work distribution, expertise and transparency. The petition says the CJI may be the master of roster but this power to exercise such authority cannot be used to assert any superior authority by the Chief Justice since it is a well settled principle of jurisprudence that the Chief Justice is only the first among equals. Mr Bhushan says this power must be exercised in a fair, just and transparent manner and in keeping with the high standards of integrity desired from the office of a Chief Justice of India who yields greater power when it comes to Constitutional cases involving constitution of larger benches. “The absolute discretion of the Chief Justice of India in allowing a particular case or disallowing another on oral mentioning is also another important aspect that needs to be scrutinised in its application and exercise,” says the petition. Mr Bhushan says the manner in which power has been concentrated in the office of the Chief Justice of India raises serious problems relating to constitutionalism and the rule of law. Citing the cases titled State of Rajasthan vs. Prakash Chand and Others and the more recent case of Campaign for Judicial Accountability and Reforms v Union of India and another, wherein the powers of the CJI to assign cases as master of roster was upheld, Mr Bhushan says, the decision in these cases is “a nullity and vitiated by the rule against bias” as the CJI ought to have recused from hearing this case pertaining to payment of bribe for favourable orders in matters pending before the CJI himself.